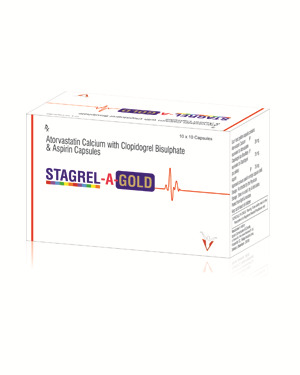 A powerful cholesterol lowering agent, reduces the risk of atherosclerosis in cardiovascular disease. Provides significant greater reduction in LDL- cholesterol & triglyceride level in comparison with simvastatin & pravastatin. Enhances high density lipoprotein - cholesterol level effectively. An effective antiplatelet drug,lowers the risk of occlusive vascular events by inhibiting platelet aggregation. Improves inflammatory responses,accelerates platelet function, vascular endothelial cell function & blood coagulation system in patients undergoing coronary artery bypass grafting. A safe and efficacious antiplatelet drug which minimizesADP-induced platelet aggregation and prolongs bleeding time. Binds selectively and irreversibly to the platelet purinergic P2Y12 receptor, thereby inhibits adenosine diphosphate(ADP)- induced platelet aggregation. Decreases the incidence of coronary artery stent thrombosis,mycocardial infarction and atherosclerotic cerebral infarction.